Thinking of upgrading my graphics card - your opinions. Topic: Thinking of upgrading my graphics card - your opinions. I require a favour. My current computer system is at 2.80ghz, 1gb ram, 9600XT 256mb. I personally feel that this will be more than adequate to run Medieval: Total War 2 when it comes out in November this year (hopefully!). However, people on the total war forums seem to have a feeling that the game will be extremely taxing on such a system. I recognise that i can't play the game on maximum settings, but i was at least hoping for low-medium settings with anti-aliasing/reflections/etc. turned off. "The Crucial Radeon X1600 PRO 512MB AGP graphics card is designed to deliver outstanding entertainment and 3-D graphics through its unique ultra-threaded core architecture and Avivo video and display technology. * Avivo™ Video and Display Engine™ HD: Connect the X1600 PRO to home entertainment devices and experience vibrant image quality. * H.264 Decoding and Transcoding: Supports H.264 decoding and transcoding, delivering ultra-high image quality for TV viewing and home entertainment. * Ultra-Threaded Shader Engine™ HD: Supports Microsoft Direct X 9.0 and Shader Model 3.0. * Advanced High Dynamic Range: HDR with anti-aliasing, blending and filtering, text compression, and tone-mapping acceleration for next-generation image quality. * HydraVision Multimonitor Management Software: Tailors your desktop to manage increased amounts of information and improve productivity. Use up to two monitors and create multiple layers of desktop workspace with Multi-Desk. * Dual link DVI-I, S-video, and VGA connectors"
Any opinions on this card (£114 inc. VAT), and why i should/should not buy this card potentially would be welcome, as well as other cheap alternative suggestions. Thanks a lot in advance, i really appreciate any help/opinions that you give me. Re: Thinking of upgrading my graphics card - your opinions. The core and memory clock speeds are pretty solid... of course you can do better... but you know. This card should do nicely for you. Also, if you were up for it, get yourself another gig of RAM. That and this card will blow your mind. Also, if you get the card can I have all the adaptors that come with it? Oh yes, i know there are some monster cards out there now. However, this card is in fact cheaper than the price i paid for my current card, and is vastly superior! I don't think another gig of ram is necessary... perhaps if i have the extra cash i could put it towards that. The processor is of course the third worry. I am happy with it, but of course... i could do better. I can't afford a whole system rehaul though, and if i were to buy more ram, a new processor, and a new graphics card i may as well just fork out for a brand new computer (stretching myself a bit thin really). The card is a good solid buy. And its priced to move so go for it. I mentioned RAM because of what I have seen with my computer. The RAM will fill in any slowdowns and will take a large load off of your processor. I have three gigs and I can run Oblivion on max everything (HDR Enabled) with no lag at all! And that is with a GeForce 6800GT! The RAM helps more than you would think! 256MB is good enough for now. for a game like total War your probably gonna want to throw in another gig of ram. thatt if you can run one game you can run another, since there all different game engine's. I don't have the money needed this minute. It may be a few weeks (perhaps longer), before i do. By priced to move do you mean it is a unique deal that won't be there for long? I'm pretty sure i want to go for it, it's a nice card and at a sensible price which wouldn't be too dear to buy. And c14dude, why wouldn't you recommend the card? Any particular reason? (edit: also, please bear in mind my budget - ican't afford to spend £200+ on a graphics card) I used to be well versed in all of the graphics cards and hardware, but since upgrading 2-3 years ago i've had no need to look at it all since. Basically, i want a computer capable of running Medieval 2 in the battle mode. My current computer is one i am very happy with, but if it gets to the point where i struggle to play the latest games then i may have to upgrade anyhow... i'm just brooding to myself now. I appreciate the help PatMan and c14dude. Thanks alot. Anyone else feel free to jump in with your view on the situation! i'm biased, i'm an nvidia guy. the two ATI cards that i have had gave me problems. He is only looking for an improvement for what he has. Not a super computer. But will it make that much of a difference? Price wise the 1600 is over £100 cheaper than the Nvidia card, and for a slight boost in performace is that really value for money? I'm off to bed now (2:30am here), but please feel free to go ahead and continue discussing this while i'm gone - i'd like to find a nice lot of posts by morning (well... afternoon by the time i will have woken up!). Good night, i'll check up again tomorrow - thanks again for the continued help guys. The Nvidia card is noticeably better. It has four more pixel pipelines and a much higher memory clock speed. However, you should get what works for you and your budget. I have a 7800 GS and it serves me very well. It does come at $300, however, so I am not sure if this is more than you are willing to pay. As i said, i'm just looking for a card that will help me to run the latest games for the next 3-4 years. My current card has, and is, serving me well, but i'm worried that it won't be able to hold out much longer. However, if i am led to believe that it WILL last for the next few years, and it will be able to cope with new games, then i won't bother buying a new card because it would be more cost efficient to build a whole new computer when the time and money is available. My current card, although old, is surprisingly resilient and long-lasting. I'm very happy with it, and will only upgrade if really need be. 3-4 yeards is really stretching it for a card, not to mention the impending release of DX10 and vista. only requirements in too games. Two years would be all i need. I was always intending on buying a new computer then and it would be the ideal time to upgrade. 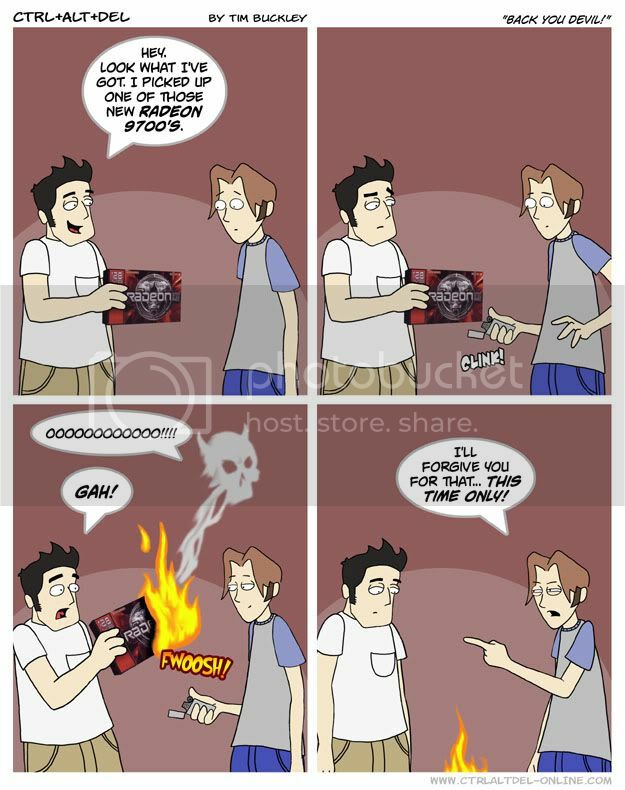 In light of that, would you advise upgrading the graphics card anyway? Or at least more ram?